Celebrate our Eastern European roots with us at this fascinating event in our beautiful 1886 room. 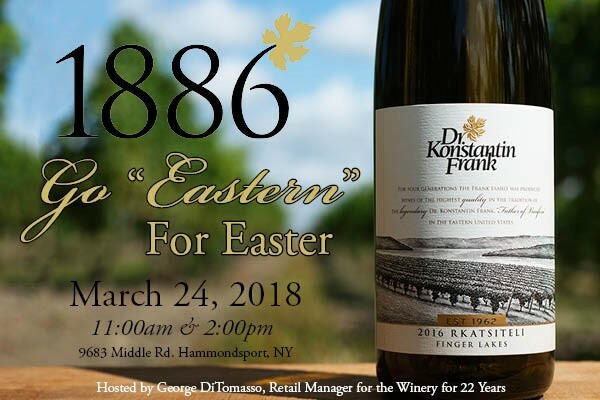 The event will feature a flight of current vintage and library Rkatsiteli and Saperavi wines alongside Eastern European cuisine. The event will be led by George DiTomasso, Retail Manager for the winery for twenty-two years. $75 per person or $60 per wine club member. Ticket price includes a bottle of 2016 "Amber" Rkatsiteli or 2015 Saperavi to take home. Reservations are required at 800-320-0735. Availability is limited.